You have to consider many aspects, if you are looking for a suitable shopping cart: SEO tools, user-friendly admin panel, the number of add-ons etc. PrestaShop is one of the platforms that provide a lot of different features out of the box. It gives wide opportunities for small and medium businesses. However, some important features are not available out of the box. In case PrestaShop doesn’t have enough power for you, check OpenCart platform. This shopping cart has a simple content management, scalability and excellent online documentation. Infographic shows pros of two shopping carts. Furthermore, if you’ve already decided to migrate from PrestaShop to OpenCart you will find several useful tips on how to move data quickly and without efforts. Switching from one shopping cart to another is a very responsible and sometimes complicated step. 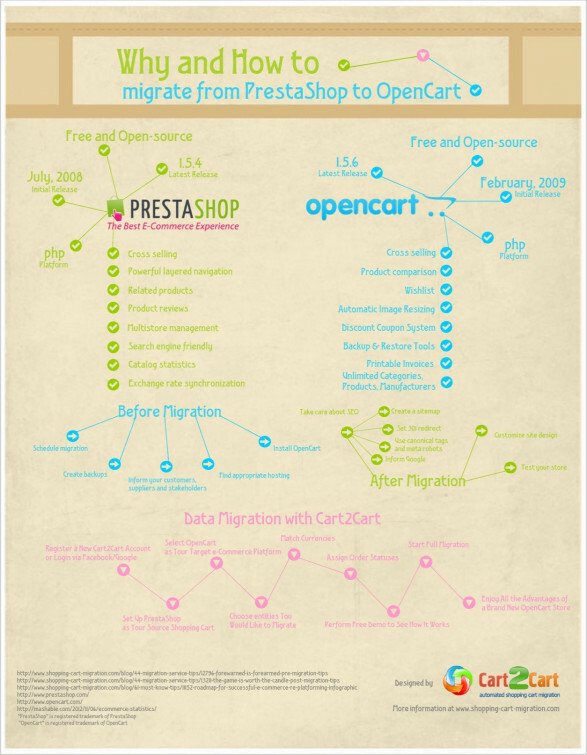 However, you cane see that with Cart2Cart PrestaShop to OpenCart migration is as simple as a game.